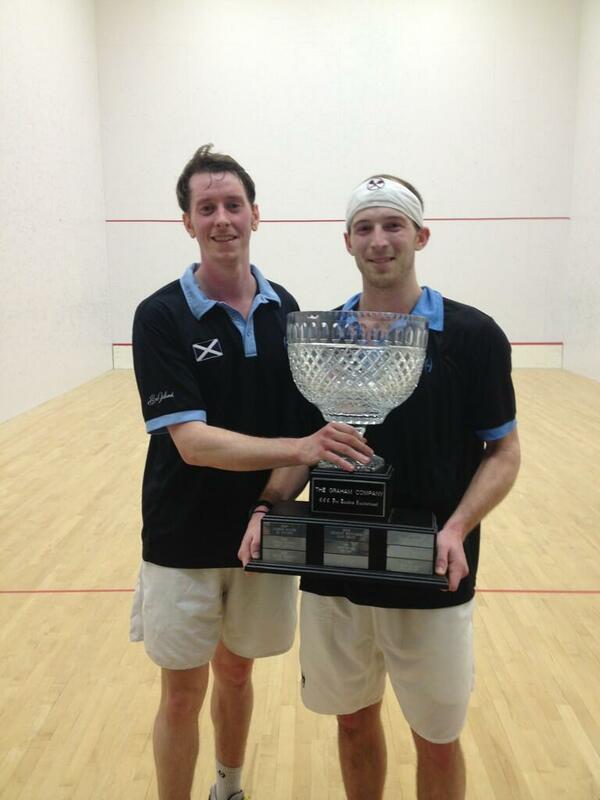 Recently, James Stout (#6) and his regular Squash Doubles partner, Greg McArthur (#10) won the Inaugural Sleepy Hollow Country Club, Squash Doubles Tournament in New York. For McArthur the victory was special as he is the resident pro at the club. The number two seeds started off with a difficult draw against Canada’s Robin Clarke (#18) and Australia’s Zac Alexander (#14) who won the Gold Medal in this year’s Commonwealth Games. Stout and McArthur lost the first game 15-5 and settled down in the second game though they lost again, 15-14. They then took the next three games decisively, 15-4, 15-7, 15-4. In their Semi-Final Stout and McArthur defeated the third seeds, Raj Nanda (#16) and Greg Park (#17) in four games, 15-5, 15-3, 13-15, 15-9. This secured their place in the final against the top seeds, Yvain Badan of Switzerland (#3) and Bernado Samper of Colombia (#8) who had an easier route with a 3-0 win in their Quarter-Final and a 3-1 win in their Semi-Final. Stout and McArthur started slowly giving up the first game 15-9, but recovering well to take the second 15-6. They took the third game, which lasted 26 minutes, on a sudden death play-off, 15-14 after Badan and Samper had levelled the game 14-all. Leading by two games to one, the second seeds fell behind 12-7 in a fast and furious fourth game. They recovered to 13-all, fell behind 14-13, levelled the game at 14-all on a cross-court volley nick by McArthur, and then lost 15-14 on a cross-court backhand winner by Samper from the left back court. Throughout the match the main players were Samper on the left wall exchanging cross-courts with McArthur on the right wall, while Stout and Badan saw comparatively little of the ball. With the match tied at two games all, McArthur and Stout adopted a disciplined and unrelenting approach and turned a 6-4 lead into 10-5, then 12-7, eventually winning the game 15-7 on the back of two winners by McArthur. The match had lasted an hour and forty minutes. The gallery were delighted to see McArthur win the inaugural event. Stout and McArthur were happy to avenge their loss to Badan and Samper in five games in the quarter-finals of the Big Apple Open in October, 15-13 in the fifth. Coincidentally Badan and Stout had partnered each other to win the Westchester Country Club Pro Doubles tournament in November, the biggest squash doubles win of Stout’s career. The ranking points Stout gained from that tournament moved him up to a career-high #6 SDA ranking in December from #9 the previous month.